Good-Looking Corpse: Helena Bonham Carter's voice does justice to the strangely alluring Corpse Bride. THERE IS a hint of necrophilia inherent in movie watching, in the act of gazing longingly into the face of a long-dead actor or actress. While there have been some good-looking corpses on film and TVLaura Palmer or the victim in River's Edgemaybe it took Tim Burton to fully illuminate the urge to consort with the dead. 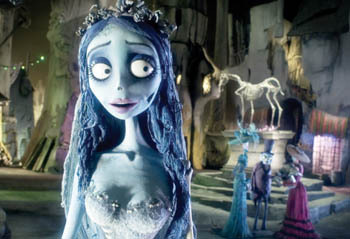 Burton and Mike Johnson's alarmingly lovely stop-motion-animated Corpse Bride features Burton's most alluring heroine since Catwoman. She is rather a knockout, count the ways: the fine-boned hand, the flush mark of a rotted spot on her cheek, the appealing azure shadows under her eyes, the winsome way her right eyeball keeps popping out. In a movie in which the color is muted as close to black-and-white as possible, this bride is radiantly blue. Based on a Russian folk tale, Corpse Bride tells the story of young, pallid Victor (Johnny Depp, doing Roddy McDowall), heir to a fish-canning fortune. He lives in a monochromatic London that looks more like the haunted, off-kilter cobblestoned streets of Prague. Victor's horrid parents, the Van Dorts (Tracey Ullman, Paul Whitehouse), have promised the pale and frail son in a dynastic marriage to the daughter of a titled (but totally skint) pair of blue bloods: Maudeline (Joanna Lumley) and Finis Everglot (Albert Finney). Although Victor and Victoria have a lot in common, shyness overcomes the lad during the rehearsal. The thundering pastor (Christopher Lee) bids him to practice the ceremony on his own time. At night in the woods, Victor finally remembers the appropriate words, and, satisfied, places the ring on what he believes to be a twig. Unfortunately, it is the skeletonized finger of a bride (Helena Bonham Carter) murdered in that very grove some time before. Hauled by this bony arm into the land of the dead, Victor finds himself in the embarrassing predicament of being affianced to a live lady and married to a dead one. The land of the dead is a more raucous place than the land of the living. The Everglots refused music to a young lady of Victoria's station, but down below there are pubs where skeletons sing and dance, and old soldiers who killed each other in the war drink each other's grog. While stuck there, Victor learns of a way to escape, as well as to save the Corpse Bride from her curse (and save himself from his own embarrassment). Dead she is, but strangely fragile. She possesses a heart that doesn't beat but can break, as she sings during one of Danny Elfman's harpsichord-iced songs. Incidents recall Burton's earlier moviesa severed hand crawling like a spider along a man's shoulders, as in Mars Attacks! ; the pews in a church knocked over like dominos falling, as when Michael Keaton's Batman was staggering through a cathedral in pursuit of the Joker. But this is his most distinctive film, freeing Burton from the remake circuit. In scenes of the adult-ruled world of the living, Corpse Bride loses the sense of animation per se. It isn't really built with the building blocks of cartoonschases, characters bopping each other on the head. It has more in common with Robert Browning, with Gilbert & Sullivan, than it does with Bugs Bunny. And Corpse Bride is even calmer than Burton and co-writer Caroline Thompson's The Nightmare Before Christmas was. Commonly, the 3-D animated film is loaded with live-action film referencesmaybe a way of reminding flesh-and-blood actors that they might be replaced one day. This referential slapstick is funny when Shrek and his friends do it, but the parade of tag lines has fouled a lot of cartoonsMadagascar, for instance. Existing in another realm entirely, and bearing only one huge movie reference (to Gone With the Wind), the film has the charm and uncanniness of an antique toy. And romance is at the forefront herein a strangely affecting love triangle and act of renunciation. Oddly, Corpse Bride opens against another ghost affair, with the phantom of Reese Witherspoon begging not to be unplugged next to her bed-ridden comatose self. Just Like Heaven seems like creepy necrophilia compared with Burton's tender and earnest love for legions of dead actors and the dying art of stop-motion animation. Burton proves something many of the techies and the money people denythat stop-motion animation has a special aesthetic that digital animation will never copy. This age-old technique has both density and fragility; depth and lambency. And it has sudden surprises, tooas when the bride's tattered veil stirs in a studio-made evening breeze. Tim Burton's Corpse Bride (PG; 75 min. ), a film by Tim Burton and Mike Johnson, with the voices of Johnny Depp and Helena Bonham Carter, opens Friday valleywide.